This Trademarks and Logos use policy (the "Policy") is based on the Ubuntu trademark policy and published under the CC-BY-SA license. You are welcome to base your own project trademark policies off it, just let others use your changes and give credit to the Ubuntu project as the original source! Version n°2. Published on June 10th 2016. The objective of the Policy is to encourage widespread use of the Symfony trademarks by the Symfony community while controlling that use in order to avoid confusion on the part of Symfony users and the general public, to maintain the value of the image and reputation of the trademarks and to protect them from inappropriate or unauthorised use. The sections below describe what is allowed, what isn't allowed, and cases in which you should ask permission. If you have any doubt, please contact us and a member of our trademark's team will be in touch with you shortly. If you are aware a breach or misuse of the Symfony trademarks in any way, we would appreciate you bringing this to our attention. Please contact us so that we can investigate this further. Symfony SAS owns several verbal trademarks containing in whole or part the words "Symfony" and/or "SF". Any verbal mark starting with the letters "Symfony", "Symf", or "SF" is sufficiently similar to one or more of the trademarks that permission will be needed in order to use it. All verbal trademarks of Symfony SAS, all distinctive signs used in commerce by Symfony SAS to designate his products or services related to Symfony are collectively referred to as the "Trademarks". Any figurative mark starting with any of each sign referred below or any sign containing in whole or part the words “Symfony”, “Symf”, or “SF” is sufficiently similar to one or more of the trademarks that permission will be needed in order to use it. All figurative trademarks of Symfony SAS are collectively referred to as the "Logos". there is no suggestion (through words or appearance) that your project is approved, sponsored, or affiliated with Symfony, Symfony SAS or its related projects unless it actually has been approved by and is accountable to Symfony SAS and the Symfony Project. Building on Symfony or for Symfony. If you are producing new software which is intended for use with or on Symfony, you may use the Trademark in a way which indicates the intent of your product. For example, if you are developing a system management tool for Symfony, acceptable project titles would be "System Management for Symfony" or "Symfony Based Systems Management". We would strongly discourage, and likely would consider to be problematic, a name such as SymfonyMan, Symfony Management, SymfoMan, etc. Furthermore, you may not use the Trademarks in a way which implies an endorsement where that doesn't exist, or which attempts to unfairly or confusingly capitalise on the goodwill or brand of the project. Commentary and parody. The Trademarks and Logos are designed to cover use of a mark to imply origin or endorsement by the project. 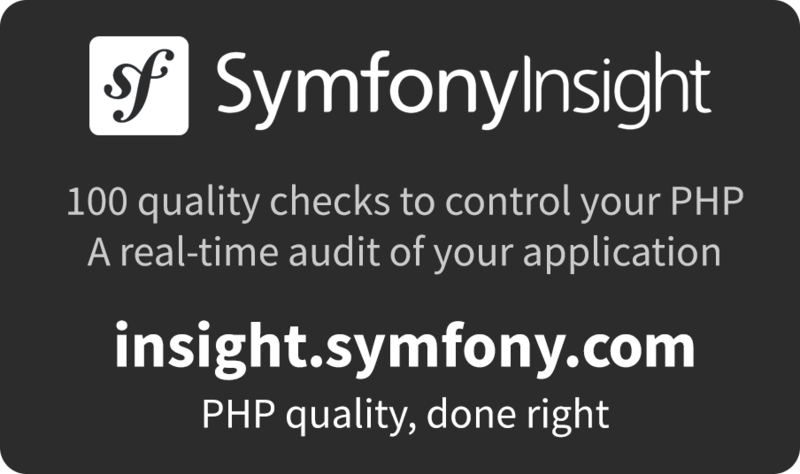 When a user downloads something called Symfony, they should know it comes from the Symfony project. This helps Symfony build a reputation that will not be damaged by confusion around what is, and isn't, Symfony. Using the Trademarks in your discussion, commentary, criticism or parody, in ways that unequivocally do not imply endorsement, is permissible. Anyone is free to write articles, create websites, blog about, or talk about Symfony -- as long as it's clear to everyone -- including people completely unfamiliar with Symfony -- that they are simply referring to Symfony and in no way speaking for the Symfony project and/or for Symfony SAS. Permission from us is necessary to use any of the Trademarks under any circumstances other than those specifically permitted above. Use for services relating to any of the above. If you wish to have permission for any of the uses above or for any other use which is not specifically referred to in this Policy, please contact us and we'll let you know as soon as possible if your proposed use is permissible. Permission may only be granted subject to certain conditions and these may include the requirement that you enter into an agreement with us to maintain the quality of the product and/or service which you intend to supply at a prescribed level. Use of a Trademark in a title or metatag of a web page whose sole intention or result is to influence search engine rankings or result listings (for example use as keyword for advertising purposes), rather than for discussion, development or advocacy of the Trademarks. Except otherwise agreed, any use of Logos shall be expressly authorized by writing by Symfony SAS. To get any authorization to use any Logo, please contact us and a member of our trademark's team will be in touch with you shortly. Our logos are presented in multiple colours and it is important that their visual integrity be maintained. Therefore, when use of Logos is authorized, it is therefore preferable that the logos only be used in their standard form but if you should feel the need to alter them in any way you should keep the following guidelines in mind. It should also be borne in mind that the more you wish to vary our logos from their standard form the smaller is the chance that we will be able to approve your proposed use. If presented in multiple colours, the logo should only use the "official" logo colours. You may use transparency and gradient/depth tools but should retain the "official" colours. In case of non-compliance with Trademarks and Logos' Use Policy or applicable law, any use of the Trademarks and/or Logos will be prohibited.